We are featuring this “freeware pick” as a tip today to remind you that you’re not limited to using one or two browsers. You can have and use as many browsers as you like. It’s certainly more convenient — and highly recommended — that you have one default browser, but that should not deter you from trying and learning about other browsers. For instance, I (TC) have Chrome, Internet Explorer, Edge, Firefox, Pale Moon, Vivaldi, Opera, and now Slimjet installed. Chrome is my default, but I frequently use the other browsers to browse the web – and I almost always have Chrome and Firefox open. Darcy has Chrome, Firefox, Edge, and Internet Explorer installed – with Chrome as her default. We want you to broaden your horizons and try new (safe) things. We want know that you’re not limited to having and using just one browser. Using more than one or two browsers gives you a chance to explore the differences between browsers – and to learn the similarities. And if you decide you don’t like Slimjet just shut down the program and delete the entire folder. No uninstallation necessary. The portable version makes no changes to your registry. So if you’re interested, there’s really no reason not to try it. QuickFill form filler – Lets you open the page and sign in in one step. Flexible, powerful ad blocker – Allows you to block most ads from all sites – or allow ads from some sites while blocking all others. And an ad-blocking override feature that lets you override adbocking if the ad blocker makes a mistake. Easily download online streaming videos to local hard disk with option to extract the mp3 audio file. Frame and enhance photos right before they are uploaded. Flexible web page translation – Translate a full page or selected text between any two specified languages. Weather condition and forecast – Gives current weather condition right on the toolbar. 7-day forecast information is one-click away. Easily share the current page on various web services such as Twitter, Google Plus, Blogger, WordPress, Gmail, Hotmail, StumbleUpon. Upload clipboard image – Easily upload clipboard image with a single click. No need to save it to a file first and then upload the file. Quickly switch between different search engines. Above: Slimjet comes with multi-featured ad-blocker. Above: Note that Slimjet is available as a portable version. That means it does not install. Just unzip it and run it. 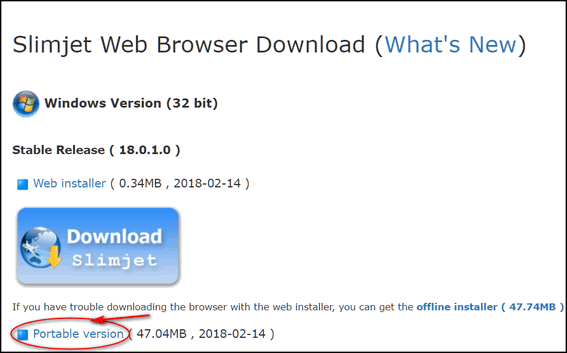 When you download Slimjet please be sure to use this page, because it has the download link for the portable version of Slimjet. We recommend that you download the portable version. Does this one track everything we do? Browsers don’t track what you do, extensions, search engines, advertisements and web sites do. That’s why DuckDuckGo search engine says “Don’t change your browser, change your search engine”.